Climate change associated with global warming has already caused extreme weather in various regions of the world. Especially in the East Asia, heavy typhoons and rainy season fronts have frequently caused the damage of heavy rain, floods, and sediment in recent years (Japan Meteorological Agency 2014). And it is expected that these weather disasters will expand in the future (Ministry of Environment et al. 2018). Furthermore, influences of extreme weather on natural ecosystems are also predicted, i.e., changes in water quality and flow regime due to altered precipitation characteristics, and changes in distribution of vegetation and wildlife due to the rise of air temperature and water temperature. Rockström et al. (2009) raised nine earth-system processes essential for survival of humanity, and showed the planetary boundary defining the safe operating space for humanity with respect to the Earth system. They also claimed that human activities can undermine the resilience of ecosystems and can increase the risk of crossing the planetary boundary. Hence, the quantification and enhancement of ecosystem resilience are required for the adaptation to climate change and global warming (Angeler et al. 2018). To what extent does the ecosystems on the earth have the resilience to such severe natural disturbances? Originally, natural disturbance favors biodiversity (D’Odorico and Bhattachan 2012) and builds biological capacity to adapt to or resist change (Palmer et al. 2008; Dee et al. 2018). And it has an important attribute conferring resilience within ecosystems (Li et al. 2012). But will the artificially modified ecosystems have enough resilience to combat intensifying natural disturbances? We still do not have much knowledge on it (Côté and Darling 2010; Andersson 2018). In Sustainable Development Goals (SDGs) of the 2030 Agenda for Sustainable Development, “Sustainable development” has been defined as development that meets the needs of the present without compromising the ability of future generations to meet their own needs, which calls for concerted efforts toward building an inclusive, sustainable, and resilient future for people and planet. It also declares that it is crucial to harmonize three core elements: economic growth, social inclusion, and environmental protection for sustainable development to be achieved. What can the ecological resilience of ecosystems contribute to the SGD’s target in terms of environmental protection? ….We recognize that social and economic development depends on the sustainable management of our planet’s natural resources. We are therefore determined to conserve and sustainably use oceans and seas, freshwater resources, as well as forests, mountains and drylands and to protect biodiversity, ecosystems and wildlife. We are also determined to promote sustainable tourism, to tackle water scarcity and water pollution, to strengthen cooperation on desertification, dust storms, land degradation and drought and to promote resilience and disaster risk reduction. It is necessary to expand our scope of vision on ecosystem management from aiming only for conserving biodiversity and ecosystem services, to aiming for enhancing ecological resilience of ecosystems (Timpane-Padgham et al. 2017; Aslan et al. 2018). Resilience is recognized as a key element in the implementation of the green infrastructure, a practical way to manage social and natural capital in a population-declining society under the climate change (Nakamura and Ishiyama 2018; Natuhara 2018). We planned this special feature to become an essential step in East Asia for the adaptation to the climate change to avoid human activity crossing the planetary boundary. In this special feature, readers will understand how the altered ecosystems by human respond to the catastrophic natural disturbances, i.e. ; how the forest salvage logged recovered from the windthrow damage (Morimoto et al. 2019), how the aquatic community in polluted stream restored from the catastrophic flood damage (Negishi et al. 2019), how the satoyama secondary forests restored after being damaged by insects and deer (Nagashima et al. 2019), how the moss community in Japanese gardens adapted to urban heat island (Oishi 2019a, b), and how the artificial coastal forests recovered from the tsunami damage (Tomita and Kanno 2019). 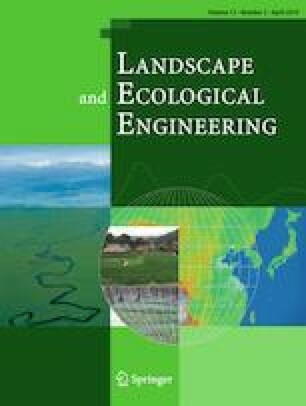 This special feature aims to offer ideas on the direction of research necessary for quantifying ecological resilience of ecosystems for scientists, and ideas on ecosystem management to enhance the ecological resilience of ecosystems for policy makers, in preparation against intensifying natural disturbance by showing various examples. Most of articles in this issue are developed from the presentations of the session on this topic at the ELR2017 Nagoya and the 8th ICLEE held in September 2017.